From this continues Kia’s marketing outreach to teen and twenty-something consumers. The Kia Soul Collective was a ten-city tour promoting the Kia Soul as it showed up at concert events where show goers could get more information about the car and if they arrived between 12pm-8pm could test-drive a car. The effort was run by Cornerstone, a full-service lifestyle marketing company. The site is divided into a various artistic interests: Music, Film, Design, Entrepreneur. All of the representatives for each section are Gen-Y up-and-comers with some established credibility. They all appeal to the creative nature of the target consumer and attempt to bring some coolness to the Kia Soul product. “Each member of the collective was tasked with demonstrating ‘how they roll’ through creating original films, art, music and more,” states the Press Release announcing the series of free concert events and the Kia Soul Collective site. The Kia Soul is in a battle of the boxes as it launched the Soul at the same time Nissan launched their aptly named Cube and Scion had recently redesigned their xB. Kia picked up some immediate buzz with their funky hamster TV ad, which was one of the more memorable commercials of 2009. They also received some decent blogger coverage from non-automotive writers. 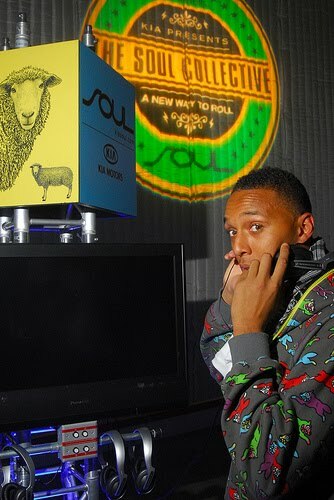 The Kia Soul Collective effort nixed the hamsters for turntables and nightclubs. The nice thing is there is still a connection across all of the efforts – the slogan “a new way to roll.” Roll can apply in a variety of ways and throughout the campaign has brought together rolling wheels and roll as in attitude. Connecting with artists is a natural integration in showcasing interesting people who have chosen a path that is definitely relevant to the target consumers. There is a Flickr account setup for the event. I browsed several of the photo galleries and couldn’t find one photo with over 20 views. This isn’t uncommon from what I’ve experienced looking at all kinds of event marketing efforts brought online to Flickr. It doesn’t seem to matter what brand or product, but few people ever view these photos and probably for good reason. They only matter if you attended the event. Watching people you don’t know sign in at tables, drive around in a car, and go to a concert you didn’t attend just isn’t that compelling. It’s probably not even worth the effort to put up these galleries for any brand. Unless you have some compelling reason to do so, like they’re the first photos of the car or a celebrity is involved; otherwise, it’s not worth doing. 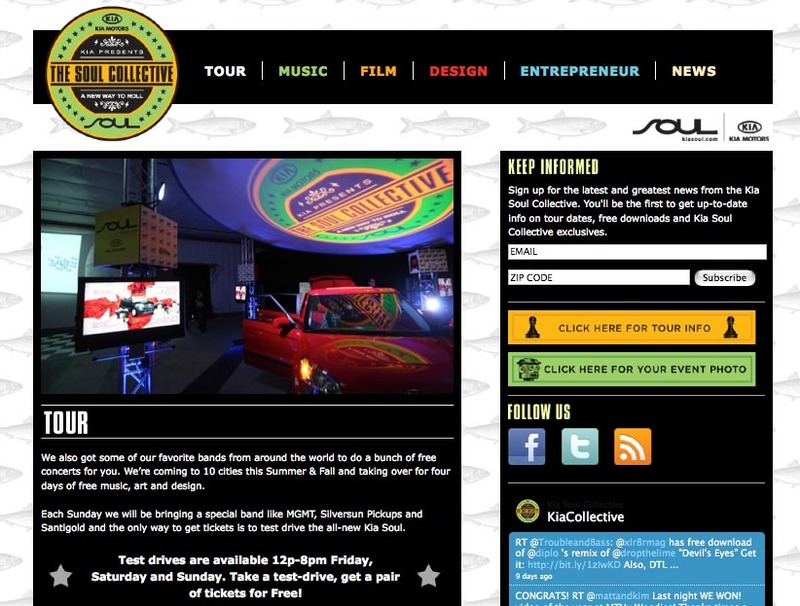 What is worth doing that is in the Kia Soul Collective site is the “Click Here for Your Event Photo” section where if you did attend an event you can retrieve it at the site and hopefully learn some more about the Soul’s marketing effort. One disconnect is that there is virtually zero product information on the site. 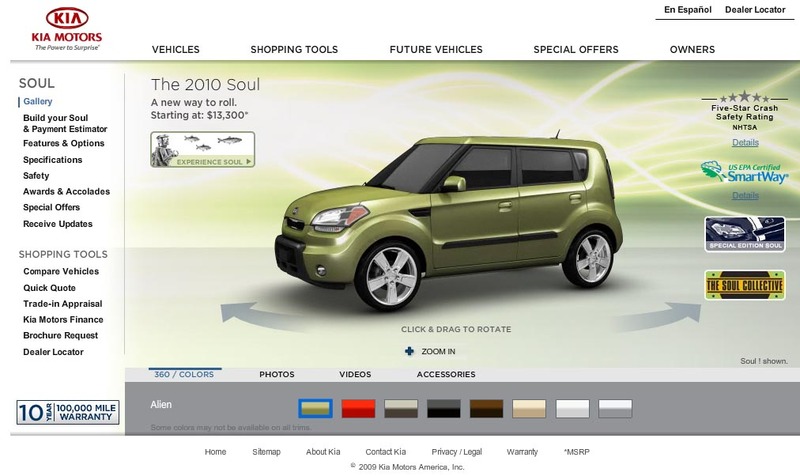 Obviously, adding product information to a hip, creative site promoting concert events could turnoff the audience Kia wishes to reach; however, providing a simple call to action to learn more about the Soul, say in the right side’s Keep Informed section would’ve been an easy way to promote the car a bit more. There is a Soul logo that is clickable to the Kia site, but clickable logos are weak Calls to Action, something stronger would’ve probably helped with what I’m guessing is a very low click-through rate to product pages. The other question that begs asking is should this effort exist as an unique site, separate from the Kia Soul Launch experience. The Kia Soul launch site is pretty odd in its own expression and the Soul Collective effort probably could’ve lived in the existing site; instead of creating a whole other web site for people to find. 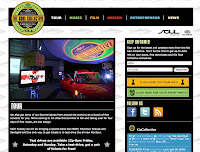 Looking at all the effort put into getting people to the Kia Soul Collective microsite, I wonder if Cummings is right. There is no point now that the tour is over and the content is old. No one has a reason to go here, yet Kia still feeds the site by linking to it from their shopping site at Kia.com. Why? Why have potential shoppers go to the Collective URL where you may deter their interest in your product and forget they were even interested in a Kia Soul? Internet users are fickle and you are just a click away to the next attention getter. That’s why it’s often a better move to integrate your marketing efforts into minimal destinations like the shopping site and a launch experience, and even that you may want to combine into one single destination. I’m personally a fan of having a site for the launch efforts that are not convoluted by shopping links. Let your main site be the destination for serious buyers or product researchers. Let the launch site familiarize visitors with the campaign and key messages you want the product to communicate, not everyone is ready to start Build & Pricing and trying to find a dealership. Anyway, the Soul Collective is another effort to combine creativity, youth and event marketing. There is nothing revolutionary here, but for what it is it subscribes to most of the fundamental elements company’s have when approaching these efforts: microsite, Flickr and a Twitter account. Being more integrated to the online efforts already in place with the Kia launch site would have alleviated the need to maintain a distinct effort, plus integration with the launch experience would’ve brought more of the digital effort into a more impactful singular effort. It still is a decent effort to reach that coveted Generation-Y demographic so many marketers wish to appeal too. Sean X Cummings is definitely wrong. Microsites, Conversion Paths and Landing pages are about getting your customers what they want, when they want it, the way they want it. In the case of Kia it was about the Kia sponsored music event Kia Soul this enabled the target audience that Kia want to get the info they wanted without having to try and navigate through Kia’s main random access web site. The only thing Kia could have done better would have been to allow Kia owners to log in and post pictures of themselves and their Kia’s at these events and let users comment and vote on the best pic, then added a blog for stories at the events. That could have spilled over into a great TV branding campaign that would have driven more respondents to the site and broadened the community of KiaSoulCollective.com and also measured the effectiveness of the TV campaign. The whole purpose of a Microsite is to cater to the nitch. If you’re trying to build a website to appeal to everyone than it will appeal to no one in particular that is when you have an orphan. Each of the landing experiences above has a purpose using the right one with the right message match will always produce far higher results than trying the who single landing page deeplink that Sean proposes. Not to mention you will get far higher SEO with the right highly relevant Microsite network than you could ever get deeplinking. We have proven this getting 12% to 20% conversion rates. So don't let Sean’s rant fool you. Microsites have a place in ever dealers and OEM’s online strategy. Thanks for your very insightful and excellent defense of microsites and landpages. I am by no means in the Sean X Cummings camp, but I do think he has some valid points and in the case of the Kia Soul Collective the content just wasn't enough to exist as a separate site to promote. I do think a landing page in the launch experience, not the shopping site would've been a great way to reduce multiple URLs to promote and also allow for some better promotion of the Kia product. Plus the launch site is already catering to that niche. I do like your idea of having event participants participate online by adding their own photos from the events. Also, the Kia Soul Collective site is set up like a blog and yet no one posted anything beyond a bio and intro video for each section. After that content is dead. Anyway, I like your thoughts on how they could've better extended this and really made this a site that could've stood on its own. Thanks for some excellent insight.